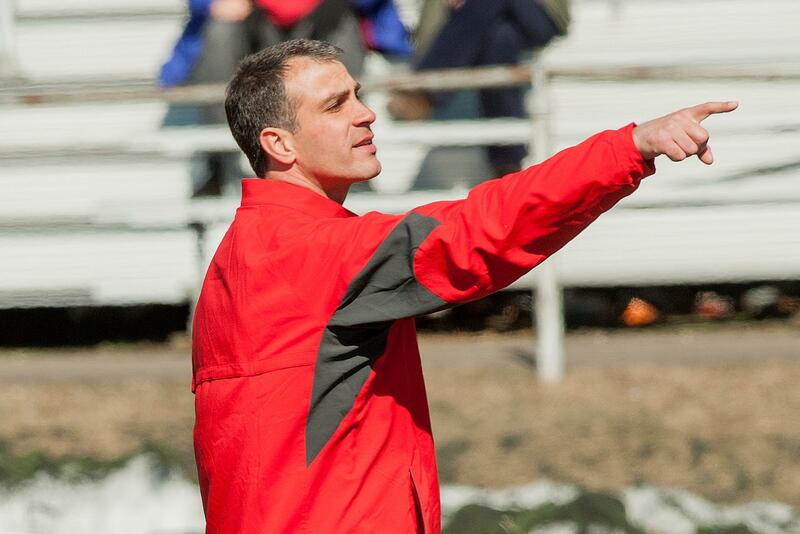 The 2015 season was Andy Copelan's seventh at the helm of the Fairfield University men’s lacrosse team. He has posted a 64-41 (.610) record with the Stags and owns a nine-year NCAA Division I head coaching record of 82-56 (.594). Copelan was named the program’s third head coach in varsity history on August 25, 2008 and has returned the Stags to the national conversation. Fairfield ranked as high as 18th in the polls last spring, having entered the national ledger in each of the last four seasons and six of Copelan’s first seven years on the sidelines. Copelan led the Stags into a new era in 2015, as Fairfield joined the nationally-prominent Colonial Athletic Association. The Stags made an immediate impact on the CAA, winning the regular season title and hosting the 2015 CAA Championship on newly-constructed Conway Field at Rafferty Stadium. Copelan was tabbed as the CAA Coach of the Year for his efforts, leading Fairfield to a 9-6 record and producing 11 All-CAA honorees, including Rookie of the Year Will Fox ’18. 2015's group of 10 graduating seniors was the winningest four-year class in Fairfield history, compiling 41 total wins and a .661 winning percentage. Fairfield student-athletes also continue to gain the national and regional spotlight as Max Buchanan ’15, Tristan Sperry ’15 and TJ Neubauer ’16 collected All-New England laurels in addition to earning First Team All-CAA recognition. The 2014 edition of the club boasted a final record of 12-4, tying the program’s single-season wins mark. The campaign began with a record-setting 7-0 start and included the team’s first-ever ECAC Lacrosse League Regular Season Championship and a trip to ECAC Championship Game. Following the record-setting season, 2014 ECAC Goalkeeper of the Year Jack Murphy ’15 was drafted by the Boston Cannons in the eighth round of the Major League Lacrosse Collegiate Draft. Murphy represents the ninth Stag during Copelan’s tenure to be drafted or signed as a free agent into the MLL ranks. Fairfield made four consecutive ECAC postseason appearances from 2011-14, including three trips to the ECAC Championship Game. Along the way, the program has earned several landmark victories. Copelan’s 2013 club recorded the Stags’ first-ever victory over the nation’s top-ranked team with an overtime triumph at No. 1 Denver, and the 2010 Fairfield team topped a Notre Dame club that went on to reach the NCAA National Championship Game. All told, the Stags have bested at least one ranked opponent in each of Copelan’s seven seasons at Fairfield. Copelan has seen his student-athletes excel in the classroom as well. During his stay at the helm, every student-athlete that has completed his eligibility has also earned a degree from Fairfield. The Stags had 39 student-athletes earn All-ECAC Academic Team honors under Copelan’s tutelage, including a program-high 10 honorees in 2014. In 2015, Drew Federico ’15 was named to the CAA All-Academic Team, with Max Buchanan ’15 and Tristan Sperry ’15 collecting USILA Scholar All-America distinctions. Signs of the Stags’ return to national prominence were immediate when Copelan took the reins for the 2009 season. His first team went 7-6 overall to earn the program’s first winning record since 2005 and a winning mark (4-3) in the ECAC Lacrosse League for the first time since joining the league in 2006. Fairfield has continued its upward trend under Copelan; the Stags have never closed the year with a sub-.500 record overall or in conference play during his tenure. Fairfield is the second head coaching stop on Copelan’s resume, who was the youngest head coach in the nation when he was hired to lead Marist College in 2004. In his first season with the Red Foxes, he was named the Metro Atlantic Athletic Conference (MAAC) Coach of the Year following a MAAC Regular Season Championship and the program’s first winning season in six years. In 2005, he led Marist to its first-ever NCAA postseason berth. His two-year run with the Red Foxes produced nine All-MAAC honorees, including 2004 Offensive Player and Rookie of the Year Keith Detelj and 2005 Rookie of the Year Dan Needle. After his stint at Marist, Copelan held an assistant coaching position at the University of Maryland from 2006-08, rising to the offensive coordinator position for his last campaign with the Terps. Maryland reached the NCAA Tournament in each of Copelan’s three seasons, highlighted by a trip to the 2006 Final Four. Copelan also served as the recruiting coordinator for Maryland in his final two seasons, with great success. Inside Lacrosse ranked the Terps’ 2007 incoming class as the second best in the nation, and the 2008 class was dubbed as a third-best in the country. Individually, Copelan helped the Terps to secure six of 2008’s top-50 high school recruits. As a student-athlete, Copelan was a four-year varsity letter winner at Bucknell University. He earned All-Patriot League accolades for his performance on the field in 2003 and was named to the league’s Academic Honor Roll in each of his seasons with the Bison.